For this challenge I used my gorgeous Daisy stamp I won, & I adore her. The copic markers I used were BG10,BG45,R20,R22,E17,E19,E00 & YG41. 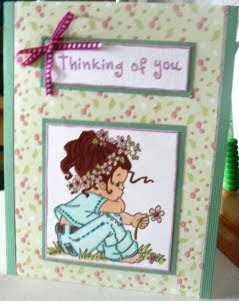 I used pink stickles for the flower centers & a $1 stamp(thinking of you). Cute pink & white ribbon is from my ribbon stash. Adorable! I love that stamp! Such a pretty card! I love these stamps. I can't find them any where here I live. Cute card.